I recently discussed this with a friend, about where “Frangipane” for an almond tart comes from. The short answer is that is seems to come from the French 1674 cookbooks as well as 1732’s confectioners dictionary (if one believes Wiki facts), but the justification behind the name just defies logic to me….but such is life. 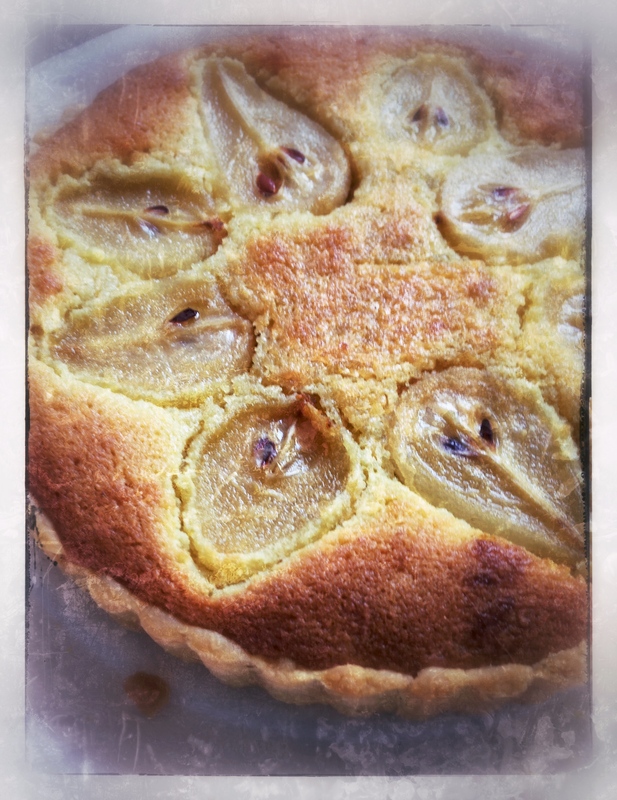 It is known as a frangipani tart, and for some of us that weren’t initially in the know, aka me, this is simply an almond tart….which is so much easier to understand! But sometimes we want to impress. Almost any fruit can be substituted instead of the pear, but it boils down to what best suits the texture and taste profile of almonds. Some fruits just won’t be as complementary as others! It’s a great tart to make. So simple, and you can store the components in the freezer for a couple of months until you require putting them together, which makes it time effective, when you want to have a great dish, but don’t have the time i.e. short-crust pastry can be rolled and pressed into it’s casing/container (and cling-wrapped or plastic wrapped) but not yet baked & the mixture of the almonds can be put into another air-tight container and frozen and defrosted when required. Unfortunately this is simply not low-carb high fat approved, however, when my mom requested this for her birthday yesterday, out of love, I made it for her. Since I have been on LCHF for 2 1/2 months, I am proud to say, I was able to watch & not yearn for a piece, when it was eaten in front of me! Beat the butter & sugar together until light & fluffy. Add the eggs one at a time, until well incorporated. Slowly add the rest of the ingredients, cake flour, almond flour, salt & extracts. Place in a container and keep in the freezer, until required. To use, get either to room temperature or put in the microwave for 10-20 seconds, to soften (for easier spreadability). With your fingers, mix the butter, flour, icing sugar and salt, until it resembles crumbs. Add the water/egg mix and mix together until the pastry is bound together in a ball. Once rested, lightly dust with flour your surface that you will be rolling out the pastry on. With a rolling pin, roll out the pastry, and then left it gently to place over a well greased tart container/tin. Press the pastry lightly into the tin and cut off the edges (I use the rolling pin to do this neatly). Now you can either wrap this tightly in cling film & plastic and freeze for use at a later date. If you require the tart now, then bake blind in an oven preheated at 180 degrees for 15minutes. Baking blind, means placing some baking paper on top of the tart & putting some baking stones OR beans (I have a stash that I simply re-use) on top of the baking paper. This is to keep the shape of the tart & prevent the pastry puffing up. I bake for 10minutes, take out and remove the paper & beans & bake for a further 5 minutes. Then I take it out, add the almond mixture into the tart, and put on top whatever fruit I am using, in this case, pears, and bake it in the oven for 30-40minutes, until it’s cooked through. Let it cool down on a cooling rack, and serve either at room temperature or cold. It’s great by itself or with a dollop of cream or mascarpone cheese! So for those not on LCHF or want an easy tart to impress, at the last minute, make these 2 components, store in the freezer, and take out, when you are in a bind & want to make something tasty & delicious & yet beautiful to look at. This entry was posted in Baking as easy as 1..2..3 and tagged almond & pear tart, almond flour, almond tart, frangipani tart, pear tart, short crust pastry by angelb38. Bookmark the permalink.